Mole Removal Costs presented by Dr. Philip Young: How much does it cost to Skin Lesion Mole Removal? Well this depends on how this is being done. Excisional means takes more time for the surgeon and this will cause the pricing to go up. For one mole, it could range between 500-1500 or more. Each additional mole will likely be less like 200-500 for each additional mole. The region or city that you get this done will impact the pricing. The reputation of the surgeon will also affect it as well based on supply and demand forces. If there is anything suspicious with your mole you can get it removed through insurance coverage. But doing this may put you in a situation where the results may not be as good as you are expecting. The surgeon who removes it for possible cancer risks is less concerned about how it looks afterwards. Other obvious reasons dictate what your results will be. Moles – is it a suspicious mole or not by Dr. Philip Young of Bellevue: There are certain things you should look out for in a mole when considering if it is a cancerous mole or not. Most doctors use the acronym ABCD’s. Asymmetry. Is the mole symmetric? If it is there is less chance that the mole is cancerous. Border: Is the border irregular or not. If it is irregular and has uneven boreders or dark spots like moles that have popped up next to it then this is worrisome. Color: If the mole has undergone some recent color changes this is something that you should be more worried about. Diameter: Most people feel that moles that are greater than 1 cm in length are more likely than ones that are not to be more at risk of having something atypical or not as normal. Bleeding from the mole that is spontaneous is not a very good thing to have. Some people feel that itchiness or discomfort can be a worrisome sign as well. So if your mole has some of these characteristics you should consider removing the mole in its entirety to get a full diagnosis with healthy margins. The pathologist needs healthy margins to make a more reliable diagnosis. Hope this helps! You can read more about Mole | Skin Lesion Removal. I see a lot of people and many times during a day I see the results of different approaches to the removal of moles. Many physicians approach mole removal through cryotherapy. This involves applying liquid nitrogen which freezes and kills the mole. It is hard to control and many times you can be left with a bad scar that can be even bigger than the original mole. This occurs because the cold temperature spreads and can kill cells and the skin nearby extending the damage and the scar. Shaving the mole off is often practiced by many physician as well. In this situation, a blade / or knife is used to shave the mole off. What is often left is the base of the mole. This allows the mole to grow right back because the base of the mole will contain cells that will repopulate what was shaved off. Excisional Mole Removal is a much superior option. But cutting is always looked upon with some negativity. If done well you can get a great result. See this testimonial on mole removal. The mole removal with a laser is another good option for smaller moles. The co2 laser is used to physically burn through the mole and is good for moles that are smaller than 3-4 mm. Knowing each option and the risks and benefits is important in deciding which option to choose. You can read about the positives and benefits of excision versus co2 laser mole removal. Here is another web page on the recovery after mole excision. Check our Dr. Philip Young’s Website at www.drphilipyoung.com. Mole Removal Recovery Diary by Dr. Young of Bellevue’s Aesthetic Facial Plastic Surgery: Come visit our new page to see the recovery process after excisional mole removal here: Mole Removal Recovery Diary. On this page we will show you what the area and incision look like after the mole has been excised and surgically removed. An emphasis on incision care is important for the proper healing of the incision. The better you take care of your incision, the less perceptible it will be in the long run. We have a great wound care and incision care page to help you take care of yourself after Mole Removal through Excision. I have many people that come to me to inquire about mole removal. There are many ways to do this. The most common ways are to excise (cut them out) or use the co2 laser to vaporize them. Which do you choose? That is a great question that many people ask me all the time. Both have some positives and negatives. With excision, you have to incise around and take out the mole. With this approach you can take a margin of tissue and you can go deep enough so you know that it will not come back as readily. You also have a little faster healing and less need to care for the wound. The healing is a little more predictable. The drawback with excision is that you need to take more tissue to make sure the closure is flat. This usually requires a wedge of tissue that needs to be taken out. This can make the excision and resulting scar a lot larger than the mole itself. Also you need sutures and you need to take them out 6-7 days later. With the co2 laser you can vaporize the mole and just a little around it. You avoid the larger excision of tissue, or the need to take out more than just the mole. You avoid an incision and sutures. But the area of that is vaporized will need to heal over and this can take up to a week or more with the wound being raw and oozing a bit. You also need to care for the area that is vaporized with cleaning 2-4 times a day and constantly have vaseline over the area vaporized. Also with the vaporization you have more of a potential for less of pigmentation that can be permanent. Although if this happens you can always have the area excised to remove the pigmentation and this would be like what you would need if you were to excise it in the first place. But you don’t always have hypopigmentation and thus could have everything work out perfectly with the co2 laser. I think recurrence of the mole is more common with the co2 laser than when you excise it out. Here are some videos to explain this during a live demonstration. low risk, inexpensive way to remove mole around eye? There are many Laser Resurfacing out there that can Skin Lesion Mole Removal including q switched lasers anywhere from 650nm to 1200nm. Intense pulse light is another possible way but with less evidence and experience out there. Excising the mole is the most assured way to fully remove it but with the cost of a visible incision. If done right you can make that incision look super however. One thing to think about if there is any recent change to the mole you should consider getting it looked at by a pathologist and hence biopsied. Posted in Mole / Skin Lesions / Cyst Removal | Comments Off on low risk, inexpensive way to remove mole around eye? 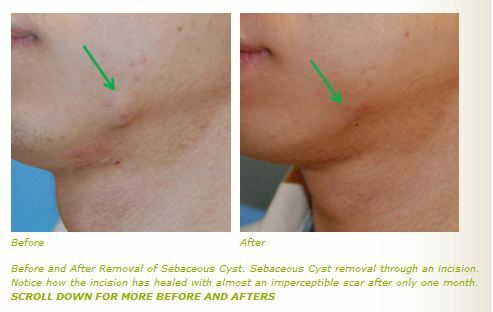 Surgical excision is probably the surest way to Skin Lesion Mole Removal but will leave a slight scar. These scars can be made to be less noticeable for you. Getting a biopsy, or pathological assessment is always something to think about. Lasers can help remove them without a scar but do not always completely remove them. Most of these are switched and have short pulses to target the moles without affecting structures around it and have less complications. IPL is a newer possible treatment that can act like a laser but there is less experience with this approach. Lasers and IPL usually require more than one treatment and can require up to 4-6 treatments or more and the mole can come back sometimes.